I am truly a child of the 1960s, with my ‘wiring’ and ideas very much an outgrowth of those times. Growing up within a large, loving family, I was always a curious sort. Growing up Catholic – questions about the nature of God, and where we are and where we come from were an itch from as long as I can remember. A lifelong citizen of the Cincinnati, Ohio area, I’ve been an entrepreneur and the owner of video production company, Panoptic Media for 25 years. I’m part of a large family, in which I find great joy. Always curious about why things are as they are, I’ve focused on Eastern and Western spiritualism, A Course in Miracles, chakras and well, most anything Life, Earth and Sun have to offer. 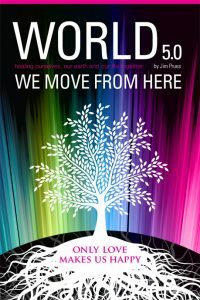 Along with authoring ‘World 5.0 – Healing Ourselves, Our Earth and Our Life Together’, I’ve been a writer, musician, activist, Occupier and candidate for the United States Congress. When I was struck with this notion of world5 while walking my wolf dog in 2004, this notion and its power became my life’s work. Since then, several iterations of this website, a declaration, a book about healing ourselves, our earth and our life together, and numerous other content, I again find myself Here, with all of you. but Now we’re on the threshold of a New Age. While Free Love and Peace were ideas too far ahead of their time in the 60s, I’m convinced that such is not true today. Indeed, World 5.0 and our New Age was birthed on 12/21/12.